Starting from humble beginning in year 1987, Federal Parts Engineering has been providing mechanical engineering solutions serving a wide range of industries such as manufacturing, oil & gas, marine, chemicals, power generation, plantation and so on. 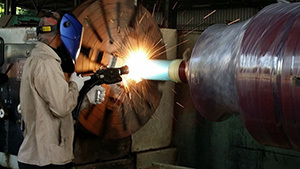 Our core business is providing the surface engineering solution by the application of Thermal Spray Technology. Being the flagship technology of Federal Parts Engineering, it provides a cost-effective method to repair, restore and reclaim mechanical components and enhance the surface properties. Throughout the decades with steady growth of business, Federal Parts Engineering has acquired a crack repair method without the need of welding – Metal Stitching. It is a cold repair on cracked or broken components made of cast iron, cast steel, aluminium and copper, served as an ultimate solution or alternative to the difficulties encountered in welding. With our versatile, experienced and teamwork-oriented workforce and management, we are able to meet the needs of customers in bringing down production downtime to minimal within budget. Federal Parts Engineering is committed to producing and supplying quality products and services that meet our customers’ requirements and budgets. Strongly based on customer needs and to achieve highest customer satisfaction, our solutions ensure the quality of the work is maintained from beginning to completion. We also ensures that the quality policy and procedures are fully understood, implemented and maintained at all levels of the organization. If you have any enquiries about our products or services, please let us know so we may assist you. Call or drop us an email. Thank You.